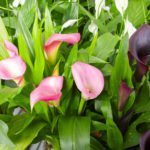 I purchased Calla Lilies (they are done flowering) and plan to put them in a container. I don't know what the best approach is to do this. Here are a few links with information that will help you move the plant.